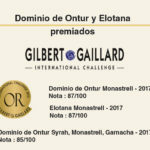 In recognition of our wines at an international level. The Silver Medal for our Patre vintage wine in the International Challenge Competition 2018. Satisfied with our achievements, we will continue our work to offer the best of Ontalba to everyone.